Cowon's D2TV includes digital TV and support for most file formats. 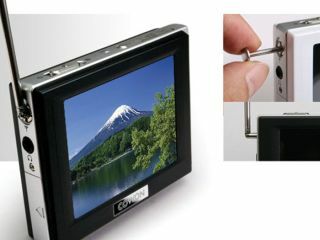 If television on the go appeals to you - and you just happen to live in Japan - then Cowon's upgraded D2TV portable media player has far more to offer than most high-profile PMPs. An outlay of ¥25,800 (£108), ¥29,800 (£125) or ¥36,800 (£154) will secure a very attractive player with a 2.5-inch, 320x240-pixel touch-sensitive screen and 2GB, 4GB or 8GB of flash memory, respectively. The D2 supports all the usual media formats and plenty extra, but the chief draw is a 1-seg digital TV tuner for watching the increasingly popular (in Japan anyway) mobile digi broadcasts. A weight of just 91g is on a par with similar machines, although the 16mm thickness is slightly more than one might hope for. On the positive side of things, battery life is rated at 45 hours for audio, 9 hours for video and 7.5 hours for digital TV viewing. The inclusion of a video-out port and a voice recorder are the kind of thoughtful touches that make a difference. Lastly, if you really must know, the D2 can handle BMP, JPEG and TXT files as well as MP3, WMA, WAV, OGG and FLAC audio formats. Video is courtesy of WMV, MPEG-4, DivX and Xvid decoding and there's even an FM tuner, an SD card slot and the ability to direct encode audio to MP3. Nice work Cowon.